Webhooks allow your script to import your waiver’s raw data and PDF files in near real-time by providing a URL to a script on your server. Within 10 seconds after a signed waiver is submitted, we’ll send an HTTP POST Request to the URL you’ve specified. 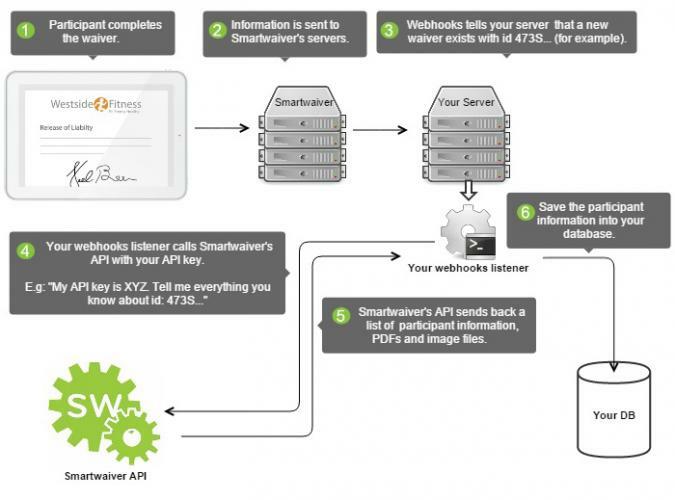 Smartwaiver also offers Webhook Queues, which are accessible through the V4 API. When a new waiver is signed, an item will be added to the queue and kept for seven days. You can retrieve and delete items from the queue at your leisure without having to maintain a public webhook endpoint. For more details and to see all the available routes, visit our API Documentation. “unique_id” is the new waiver’s id. The value of “unique_id” can be used to call the API using query option “rest_waiverid”. This will allow you to obtain the complete waiver’s information (including full name, date of birth and the credentials needed to download the PDF to your server). “credential” is an optional value which allows you to verify the integrity of the HTTP POST Request. See Validating Webhooks below. “event” describes what prompted the webhook. For now this is exclusively “new-waiver” but this allows us to expand the purpose of webhooks in the future. It would be wise (in preparation for future expansion) to write your script to ignore events other than “new-waiver” for now). The endpoint should acknowledge the receipt of a webhook by returning a 2xx HTTP status code. Any other information returned in the request headers or request body is logged but will be ignored. All response codes outside this range (3xx, 4xx, 5xx), will indicate that you did not receive the webhook and the webhook will go into retry mode. To make development easier, we allow both HTTP and HTTPS Webhook URLs. If you use an HTTP URL, the communication to your server is not secure. Therefore, it isn’t wise to include personal information. All the information can be securely accessed by calling our API (which exclusively uses HTTPS). <Waiver UniqId> is included in the HTTP POST Request and <Webhook Endpoint> is the URL the request was sent to. If “credential” is not set or not equivalent to the MD5 value above, the HTTP POST Request was corrupted and should be ignored. Important: API Keys are different than the Webhook Private Key. If the HTTP POST Request fails or takes too long to connect (timeout of 5 seconds), Smartwaiver will try again every 5 minutes. If it fails five times that individual webhook will be canceled and a log will be created ([view log]) but future waiver’s webhooks will continue like normal. If more than 50 webhooks fail in a row, webhooks will be disabled for your account and an email will be sent to the owner of the Smartwaiver account. You will be able to re-enable webhooks by logging in and resetting your Webhook URL. If you need to know which of your customers have set up Webhooks, we recommend customizing their Webhook URL so it passes their customer ID. and replace "1234" with their Customer ID. If we require multiple IP addresses in the future we'll add them to this XML file 24 hours before Webhooks start being initialized from your IP so it's a good idea to automatically import the list every night if you are using it to filter what IPs may call your script. How do I use Webhooks for specific waivers?